plus I knitted a couple of things and sewed a few clothing items. What would you like to make or do next year? So many gorgeous things, Vicki! 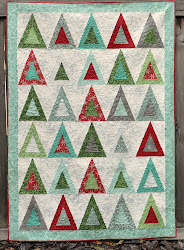 The watercolor quilt is just stunning! But my favorite just might be the chickens. Soooo cute! This year I want to make a kaleidascope string quilt for our bed and a whirlygig quilt for Trey. I want to finish a flannel quilt that I started for Sage years ago, but gave up on because it was a serger quilt as you go thing and my old serger didn't have differential feed and it was getting all wonky. Sage found it recently and still wants it, and now my serger should do just fine, Yay! Oh, and with your wonderful encouragement, I really do want to try to design fabric. Those are my goals (in addition to losing another 25 lbs, LOL). Well, wow!! I love your Year-in-Review idea. A real sense of accomplishment and job well done. My goal is to continue exploring mixed media projects and learning new methods & supplies. Happy, creative 2011. Very nice collage! 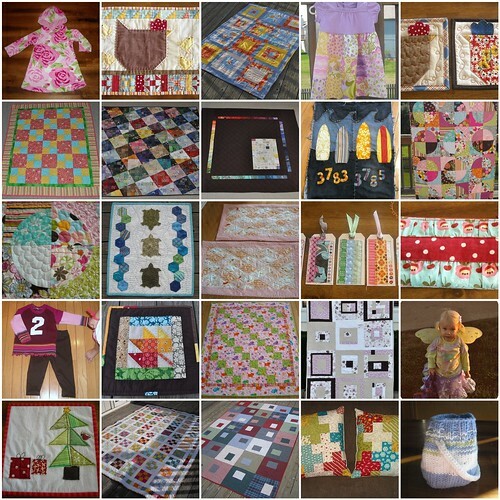 I would like to finish my block for each month of 2010 quilt and my I-spy quilt. Woot!!! Look at all you've done!!! Look out 2011!! !